When the massage was over, Jeremy gave Bryna a big kiss. Jeremy “JJ” Mantos sits patiently on the table as relaxing music flows behind him. He is about to have his first massage. Pretty routine stuff, except Jeremy is a dog. 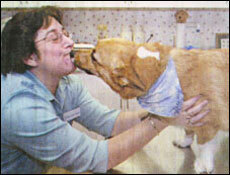 Blue bandana tied firmly around his neck, the four year old Pembroke-welsh corgi is at first a little antsy, but as certified dog trainer Bryna Davidow begins to gently knead his left foot he becomes visibly calmer, eyes focused forward, tongue wagging. “Older dogs tend to be brought in more frequently…but it’s good for puppies too,” says the cheerful Davidow, a 12-year veteran dog trainer. “Dogs are skeptical. … The first massage is 10-20 minutes. I don’t get into any deep tissue work, I want it to be a pleasurable experience,” says Davidow. Davidow currently offers the service on a complimentary basis at the Natick Animal Clinic each Saturday, in addition to private appointments. Costs run at approximately 30 dollars for each half hour. He highlights the positive result on a dog’s lymphatic system as well as muscular and skeletal increased range of motion. He says massage can relieve pain from back spasms and helps joints work better. Caviness likeness the health benefits to those of humans getting massaged. For example, as with athletic humans, very active canines get sore muscles and massage can really help. Not everyone is catching on as quickly Besides the sheer newness of dog massage, there is another element that is raising eyebrows among veterinarians; there are currently no national certification requirements for dog massage. Davidow is soon to receive her certification from the Bancroft School of Massage in Worcester. The school opened in the 1950s as a place of study for human massage and began offering its small animal massage program in 2003. The program lasts seven months to a year. Classes of no more than 20 students are fully trained in anatomy and physiology and are under the supervision of both veterinarians and massage therapists. There is a major emphasis on hands-on learning, unlike other available programs done through videotape training. Susan Weinstein, executive director of the Massachusetts Veterinary Medical Association, echoes Gagnon in terms of veterinary involvement. . “If they say, ’Don’t bother checking with your pet’s doctor,’ that would be a concern,” she says. She guesses many vets don’t recommend any alternative therapies, but thinks they do have relevancy. “Chiropractics and acupuncture have found their place … the profession is very much in transition on that,” she said. Weinstein thinks eventually vets will probably offer dog massage on premises in a mobile capacity, meaning a visiting masseuse once a week or so. Besides the medical skeptics, dog massage also has some unique limitations. “Typically a dog will put up with 20-30 minutes worth. Any more and they get itchy, the attention span isn’t the same as humans, says Davidow. “A dog’s responsiveness depends less on the breed and more on the personality,” she says. “Some dogs just don’t like to be touched,” said Caviness. Caviness acknowledges the practice of dog massage is still in its early stages and a lot of vets still consider it an alternative therapy. However, he believes dog massage will one day join more mainstream veterinary practices. Back at the Natick Animal Clinic, feedback for Davidow’s newly introduced service has been quite positive. And after his owner has snapped the last digital photo capturing this day of luxury, Jeremy coolly trots out of the room, perhaps with an extra spring in his step.